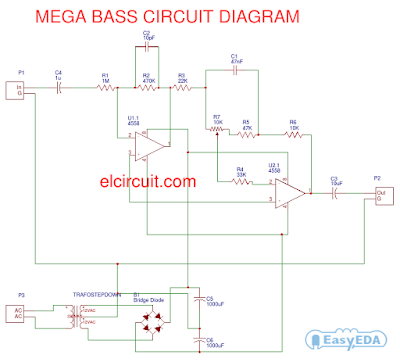 The megabass circuit is a modified Baxandall tone control with no bass cut and no treble control. It boosts frequencies from about 30Hz to 160Hz can boost by 14dB. The input capacitor can be replaced with a .01uf cap if you wish. The 10pf capacitor is optional and will start rolling off everything over 15kHz. 5pf will double this to 31kHz. The tone control requires a low impedence input. If you already have a low impedence input, the input buffer can be removed. However, the output is inverted. The opamp is not critical. A 4558 would be just fine. I do not show the parts for the +4.5 reference. Here is the +4.5 voltage divider I used. IC 4558 is a monolithic Integrated Circuit designed for dual operational amplifier. 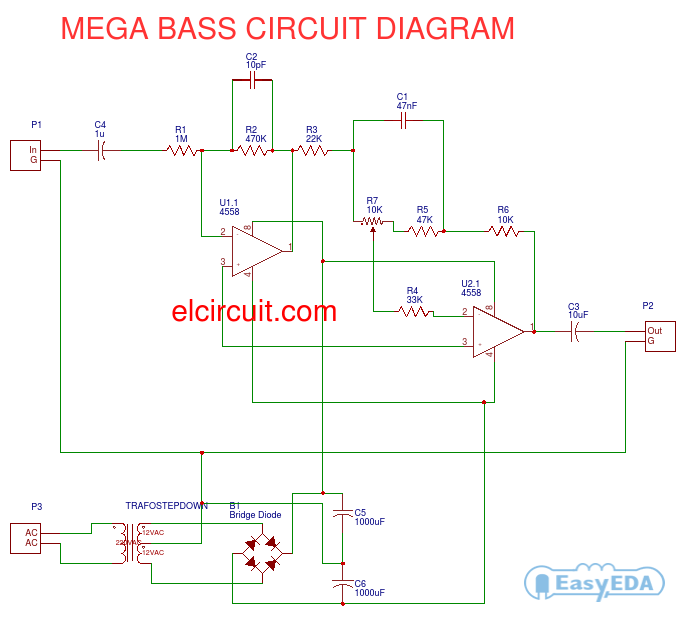 Can you tell me where the wrong circuit? I wired the circuit no sound but deep harming from the speakers.i used dual symmetric power supply 12v. Could this be the cause?